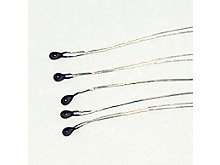 The Keysight 34308A thermistor kit contains five 10k Ohm at 25 degrees C thermistors, epoxy encapsulated with bead construction. The operating temperature range is 0 to 75 degrees C, with 0.1 degreec C interchangeability. The 34308A is recommended for high accuracy, high sensitivity temperature measurements and for calibration of the Keysight 34970A multiplexer modules. The Keysight 34308A is compatible with the Keysight 34401A, 3458A, 34410A and 34411A multimeters. The 34308A can also be used with the 34401A, however, an external program is required to convert the resistance measurements to temperature in addition to rewiring the bare wire termination.